Shift Details allow you to add extra information to a Shift on the Roster. You might need to let Staff know when they are working up a level, in a different role or a particular task. Examples of this include, Supervisor, Barista or Closing. 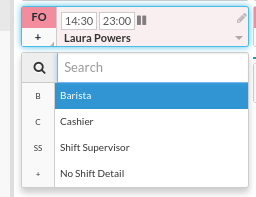 Shift Details can be added to Shifts on the Roster which is then reflected when Staff receive their Roster by Email or SMS. If you need a further hand with how to set this up, have a read of the Add or Edit Location & Team article first. Scroll to the bottom until you see Shift Details and you'll see an empty field. Click in the field and type the name of the Shift Detail. Once it's saved, the grey box around the name will disappear and a red cross will show at the end. When you've finished, just click Update Team Details at the bottom to save. To apply a Shift Detail, you just need to ensure the relevant employee is in the Team that the Shift Detail is added to.